Midnight is the right time for love and good music. 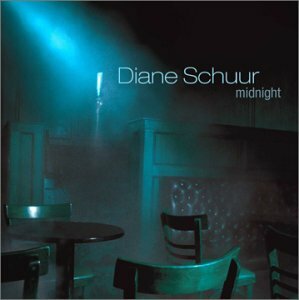 On her third release for Concord Records, Midnight, jazz vocalist Diane Schuur sets the mood for romance. For this album, she works with hitmaker Barry Manilow and his longtime collaborator, Eddie Arkin. The result is a beautifully crafted album of 13 songs that showcase Diane at her best. She open the evening swinging on the title track “Midnight” complete with a big band. “When October Goes” is one of my favorite Nancy Wilson songs and Diane has given me reason to love this song even more. Each of her duets are exquisite. She pairs with jazz vocalist Karrin Allyson on the playfully naughty “Stay Away From Bill”, teams with R&B crooner Brian McKnight on the Latin flavored mid-tempo “I’ll Be There” and closes out the evening with Barry Manilow on the intimate ballad “Anytime.” Diane has the ability to convey so much emotion in her songs. She glides effortless with her three and half octave range through her reading of “Consider The Point From Both Ends”, floats on the cool bossa nova tunes “What Is Love?” and “Our Love Will Always Be There”, and reflects poignantly on the well-orchestrated “He Loved Me”, a beautiful tale of a love that has ended. Definitely a heart wrenching as is the powerful “Good-bye My Love.” Diane lets go of her troubles as she catches the “Southwind” to take her away from the blues. “No Heartache Tonight” is another swinging tune as she shakes off the blues and soars vocally like an eagle in flight. Diane accompanies herself on solo piano as she sings the lush ballad “Life Is Good”, which gives us a self-portrait of her wonderful life. This gem will definitely be in her repertoire for years to come. Diane is joined on this wondeful musical journey by a host of spectacular musicians including Alan Broadbent, Randy Kerber, Anthony Wilson, Paulinho Da Costa, Peter Erskine, Bill Liston, Warren Luening, Andy Martin, Chuck Berghofer, Eddie Arkin, and Dan Higgins, and Harvey Mason. Midnight is sure to be a part of many of your evenings. This entry was posted on Thursday, December 11th, 2003 at 8:09 am. It is filed under Music Reviews and tagged with Diane Schuur, jazz, Midnight, vocals. You can follow any responses to this entry through the RSS 2.0 feed. “When October Goes” is a beautiful song. Legendary songwriter Johnny Mercer’s widow gave Barry Manilow a number of Mercer lyrics that had never been set to music. Manilow wrote the music for this song (even recorded it on the under-appreciated 1984 release, “2:00 AM Paradise Cafe” album). It is a new standard that I hope more singers will add to their repertoire.